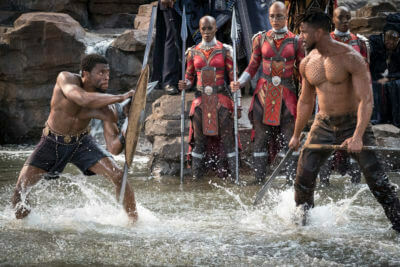 Black Panther is the 18th film in the Marvel Cinematic Universe and is being praised for diversity, as it has an all-black cast, but is it any good? The short answer is yes. It’s not groundbreaking but it is a very enjoyable science fiction action film and will take its place in my top five Marvel films. If you remotely liked any of the previous Marvel films. I would highly recommend this one. One of the main things I liked about this film was the villain. He was intimidating but grounded and, most importantly, he was understandable. We got where he was coming from, he didn’t want to destroy the world for no reason. He had a tough childhood and thought he was helping; he was the hero of his story. Also, even though the world was at stake, the characters we had come to like were the focus, so the danger seemed real, keeping the tension high in the key scenes of action. The characters were another positive for the film. Even though I had some problems with the overarching plot, the characters were formed very well. I wanted them to succeed just because I liked them. This was because of a mixture of great casting and acting. Every actor felt like they belonged. The only character that distracted me was Martin Freeman, but that is just because I know his real voice well, so an accent will always throw me off. Another strong point for this film was the world-building. The best way to describe it is “sci-f”i. This magical city where Black Panther lives is filled with technology that would make Tony Stark jealous. All made out of bright colours, so it remains visually interesting and never fades into a boring sea of grey. The only bad thing is, we saw very little of the city. It would have been nice for more action to take place in the city, showing more of this futuristic world. The action is mixed. One scene near the beginning has the illusion of being shot in one take and looks beautiful. Other scenes later in the movie never live up to this scene, tarnishing the good action later in the film just by comparison. The third act should be where it all lets loose as the action ramps up to a crescendo. In this film that just did not happen. Another mixed thing about this film is the comedy. The tech genius in this film, Black Panther’s sister, is meant to be the relatable funny youth. Sometimes I found her funny, but she made a “what are those” joke. That alone is enough to call the comedy mixed. Other than that, there were no major jokes that fell completely flat. Just, if you watch this film, prepare yourself. My main qualm with this film is the plot. There are no surprises. Everything is predictable and paint-by-numbers. Going into “deep spoilers”, halfway through the film they fake the hero’s death then continue to pretend he is dead for over 10 minutes. No one in the cinema was surprised when he reappeared. It was frustrating as I felt like they were insulting my intelligence when trying to trick me into thinking he was dead. Also, the seemingly main villain, Claw, was killed off halfway through, leading to a sag in the pacing. And, now that I am not avoiding spoilers, I need to add one thing about the villain. Although I liked him, it did become another case of the hero’s final showdown being against a villain with the same powers, which has been done so many times I now just find it dull. In conclusion, this film has a lot to like and is entertaining to watch. The plot brings nothing new to the table, but the characters are likeable and the action is solid. I would say that someone would like it the same amount as other films commonly dubbed the “best of Marvel”.